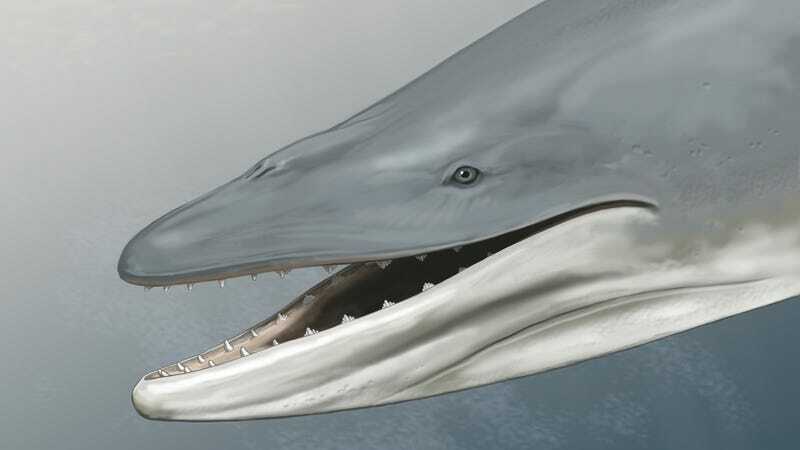 Artist’s depiction of Llanocetus denticrenatus, an ancient precursor to the baleen whale. Modern filter-feeding baleen whales use comb-like structures in their mouths to scoop up large volumes of itsy-bitsy animals and microorganisms. But as new research reveals, their ancestors were remarkably different, featuring sharp teeth that they used to attack prey. Baleen whales, a group that includes humpback and blue whales, are the largest animals on Earth, emerging during the Late Eocene Era around 35 million years ago. The origin of these bulk-feeding animals, and how they came to acquire their unique baleen filters, remains a mystery owing to the lack of fossil evidence. An analysis of a 34-million-year-old whale skull uncovered on Seymour Island in Antarctica is now providing some important new clues. As the new research shows, the ancestors of baleen whales featured sharp, widely spaced teeth and measured about 26 feet long, which is actually quite huge for the time and for a toothed whale. These ancient whales exhibited no signs of baleen—the keratin strainer that enables filter feeding. This suggests baleen emerged later in history, and along a different evolutionary path than some scientists had suspected. This species of whale is known as Llanocetus denticrenatus. It’s the second oldest baleen whale ancestor ever discovered and is a distant relative to modern humpback and blue whales. The analysis of the skull, performed by Felix Marx of the Royal Belgian Institute of Natural Sciences and R. Ewan Fordyce at the University of Otago in New Zealand, shows that Llanocetus had well-developed gums and teeth. By the looks of it, this creature was likely a formidable predator—a kind of extra-large version of the contemporary orca whale. The results of this new study were published today in Current Biology. Previously, scientists had figured that baleen and the practice of filter feeding emerged when whales still had teeth. Analysis of Llanocetus’s mouth, however, suggests this wasn’t the case, and that whales lost their teeth prior to the emergence of baleen. An intermediary feeding style, likely suction feeding, was sandwiched between the two feeding modes. Marx and Fordyce documented a series of grooves on the roof of Llanocetus’s mouth. In modern filter-feeding whales, these grooves contain blood vessels that supply the baleen. In the case of Llanocetus however, the grooves were clustered around tooth sockets. Marx and Fordyce speculate that the large gums in whales like Llanocetus slowly evolved to become more complex over time, eventually giving rise to baleen. This transition happened only after teeth disappeared as a trait, replaced by a feeding style in which biting was replaced by sucking in small prey, similar to what some whales and dolphins do today. Baleen, the authors argue, helped the whale to keep small prey inside its mouth more effectively. Alistair Evans, an associate professor and evolutionary biologist at the School of Biological Sciences at Monash University in Australia, says this study is a long-awaited full description of an extremely important fossil. Evans said the authors were well justified in concluding that the animal spent much of its time capturing and consuming other marine animals. He said the size of the whale was also extremely impressive, being very large for so early in whale evolution. Robert Boessenecker, a paleontologist at the College of Charleston, said this research is “a long time coming,” and he’s excited by the findings. But given this fossil’s “very strange” mouth and teeth, he believes a simple interpretation of its eating habits isn’t justified. Moreover, he’s not convinced that baleen emerged in the way the authors claim. No doubt, there’s still lots to learn about whales and the origin of filter feeding. The key is to find more fossils—a daunting task given the aquatic environments within which these ancient animals lived. Correction: An earlier version of this post incorrectly dated the Late Eocene era.